Black Panther is another Marvel Comics film – from a production line that doesn’t seem likely to dry up any time soon. Due to its almost entirely black cast, and the fact that it is based in Africa, there was a lot of hype around the film and it was dragged into the online culture war. However, to miss this film through fear of it being another liberal Trojan Horse would be to miss a genuinely excellent piece. It is, simply, very entertaining. It follows a fictional Africa country called Wakanda that owns vast quantities of a rare metal called vibranium. Armed with this commodity it has become the most technologically advanced nation on earth. The science around this is never explained – nor does it need to be, for the sake of cinematic succinctness – but the gist is that the country’s weapons, ships and machinery have put it way ahead of the rest of the world. Using some holographic trickery, the Wakandans have managed to disguise themselves as a dusty, poor third world country and avoided the prying eyes of the world. When our hero, King T’Challa (Chadwick Boseman), is thrust on to the throne following the death of his father, the Wakandans’ decision to retreat from the world is thrown into greater focus. 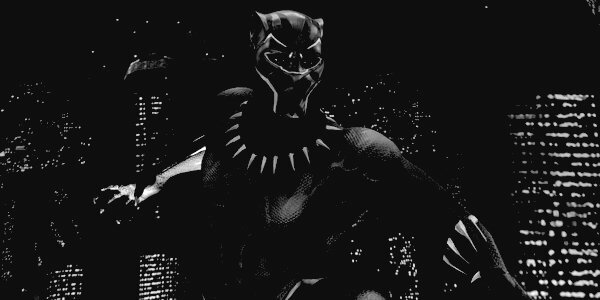 T’Challa’s uncle was killed by his father 30 years ago for selling some vibranium in order to fund an uprising that would break the African-American community out of the poverty they were living in. His uncle left a son, Killmonger (Michael B Jordan), who is the villain of the piece when he returns to Wakanda with vengeance on his mind after growing up in a poverty-stricken African-American community. He wants to use Wakanda’s technology and weaponry to subsume the world under the yoke of Wakandan oppression for the crimes of colonialism. Killmonger is someone with understandable grievances who nonetheless goes way too far in trying to exact revenge and in the process makes himself worse than the people he hates. This is the ultimate tonic against the victim culture so popular nowadays: to be perpetually angry and bitter about your past is to perpetuate the misfortune and, ironically, leave the perpetrator of your misfortune in control of your life long after the crime. Although the audience is supposed to sympathise with Killmonger’s plight, he is still the villain due to his rage and violence. The music was a personal highlight and the cinematography and acting were of a very high standard too. The film looked great. Of the Marvel films I have seen it is my favourite (although Logan, as yet unwatched, is meant to be great) but it still ranks some way behind The Dark Knight and Batman Begins in my mind. There were a few unnecessary jibes such as ‘white boy’ and ‘colonist’ thrown in for good measure but if it wasn’t for the culture war waging at the moment I doubt if I would have noticed. The current political climate is turning everything into a potential battleground but it is good sometimes to just shut the noise out. In this instance I gave the film the benefit of the doubt. After the horror of The Shape of Water, which has given me sleepless nights, it was refreshing to watch a good old-fashioned film that entertained me. That some people have attempted to co-opt Black Panther for political ends, frankly, is of no concern. It didn’t seem that the filmmakers set out with any other intention than making a good film. I thoroughly recommend you go and watch it with an open mind. You won’t be disappointed.